We have visited a lot of sites in Germany since Bergen Belsen-in Berlin, the Wannsee Villa, where preliminary plans for the “Final Solution ” were signed off on after a one day conference, the Memorial to the Murdered Jews of Europe in the heart of the city, the Reichsbahn train platform, Track 17, where the Jews of Berlin were deported almost everyday for nearly two and a half years. 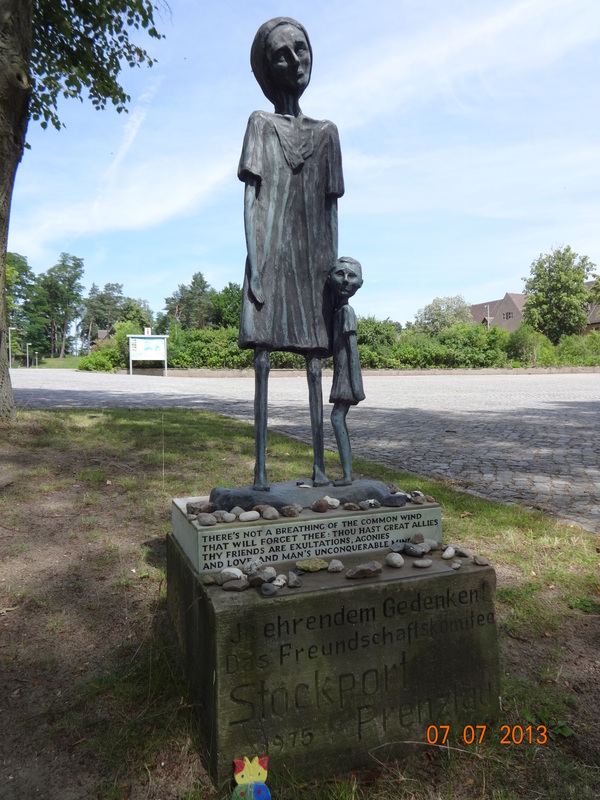 We also visited Ravensbruck and Sachenhausen. Ravensbruck is a couple of hours north of Berlin, in the former East Germany. It is notable for many reasons, probably first that it was a camp for women, and also a training faculty for SS camp guards-3500 women guards were trained here, and about 500 were in service. 130,000 women prisoners passed through here, and towards the end of the war, another 20,000 men. No barracks are standing today, the houses for the SS leadership remain just outside the camp wall, where they lived with their families. Each day the camp gates would open and thousands of prisoners would stream out into the community for their slave labor assignments. Kind of hard to hide it from the kids. I suppose the attitude was that it was difficult, distasteful work, but the kids had to realized that it had to be done for the wonderful world that they were creating for the children’s future. For Matthias, herein lies the greatest danger. It is important to have the past in front of you- NOT in the back of one’s mind, as one moves forward. The lesson may be simply how to “behave” , not just for Germans but for everyone. Ravensbruck. Prisoners’ gate on left, SS on right. 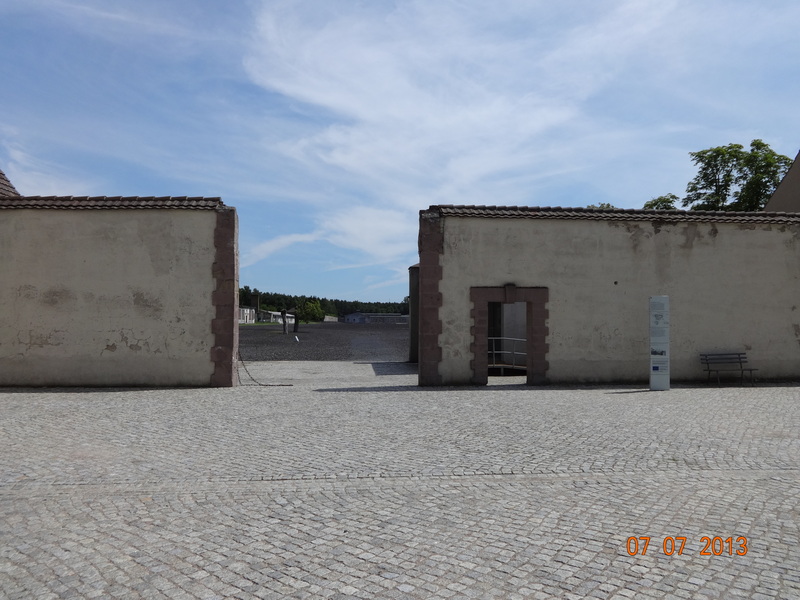 He walks us through the main camp entrance, where thousands of prisoners would pass everyday, explaining that for years he would avoid the single door entrance that the SS guards used-until one day a survivor he was leading on a tour walked through it, to symbolize her victory at this place. He notes a few additional stories. Survivors corroborate that when new SS female guard recruits would come for training, initially they do not know how to deal with the new job. Industries wanting slave labor must send their own guard recruits, too. They are not kind, but they do not seem possessed with the will to carry out this abhorrent work. Former prisoners would say that always within about two weeks new staff would have overcome the “cognitive dissonance” that would allow them to do their job without compassion. They become “hardened” and “get over it”. Ravensbruck was built for 3000 prisoners. At its height it held 35,000. 30,000 were killed here. In the beginning the SS does NOT want women with children in the camp. But as more and more territory is overrun, the camp swells. After the Warsaw Ghetto uprising in 1944, there are hundreds of pregnant women. Some are forced to abort; as numbers well, women give birth and the babies are taken to a “hospital” where they slowly starve to death. The crematorium works nonstop. Ash piles are created and dumped into the nearby lake as the Russians close in. When the camp is overrun by the Red Army, 2000 women and 2000 men, mostly to infirm to be death marched out of the camp, are found, but not before the Germans had installed a small operating gas chamber, where 5000 Hungarian women were murdered in 1944. I think that the following story resonated the most with me as an educator of young people. The butcher’s son delivered fresh cuts of meat nearly daily to the SS mess hall, which still stands. Late in life, the old man tells Matthias of his feeling as a young teen-going through the camp gates to deliver the meat, seeing the emaciated and foul smelling prisoners, and believing fully all he has been taught- that these people are indeed subhuman, vermin to be eliminated. It’s true. Just look at them. Just smell them. Disgusting. Everyday it is the same. They even march through the town to the labor sites. Best to keep a distance from them. It’s the same until one cold morning when a new transport of women arrive-stripped naked, healthy, humiliated, shivering, crying, shocked, trying to cover themselves in the plaza. Now it is his turn for a shock. These are not subhuman, but girls his age and older, in distress. And they are naked. He has probably never even seen his mother or sister undressed before. And it is at this moment that he realizes that his teachers and the adults in his life are wrong- that what he is witnessing is a crime. And now perhaps sixty years later he unburdens himself. Finally, a survivor, Annika, recounts that the Scandinavian Red Cross appeared in the weeks before liberation and in the presence of these new people, the women stroke their hair (as it is growing in again after being shorn off) trying to make themselves presentable. As she is evacuated over the Danish border, something strange happens. People are crying at her miserable condition. At every stop, they crowd around tearfully, and want to help… What is this? Traveling through the towns in Germany, she recounts, no one cried. No one helped. To date, says Matthias, no former German perpetrator has shown remorse for his/her wartime behavior. The bystanders probably included most of the victims’ neighbors and acquaintances, and certainly most of the townspeople where the crimes were perpetrated, of thinking age. That for me is one of the axioms that will come out on this trip. But, suspending judgement- we were not there ourselves and placed in that positon-we have a lot to think about. But we must think about this too-Hitler never murdered anyone by himself. 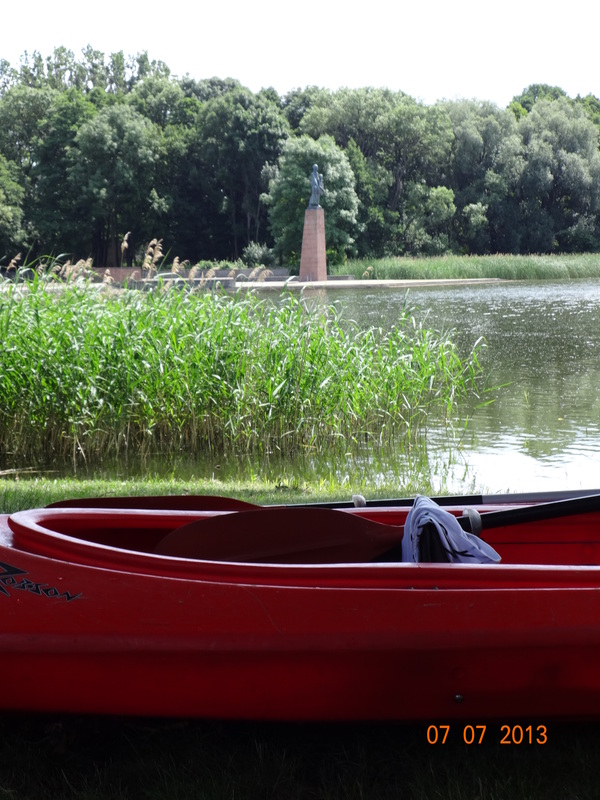 The lake at Ravensbruck, where ashes were dumped. You’ve got a nice book going here, matty. Keep it up.